in Global Exposure. It has been made possible due to IIPM’s unique GOTA programme. This Programme was initiated in India before any other B-School in India thought of starting a programme like this. 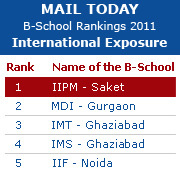 IIPM had always believed in making their program curriculum truly global. In a unique collaborative effort with some of the institutes in the world, students from IIPM today study for a week at the home campuses of the institute like The Darden School of Business, The McCombs School of Business and are taught by some of the most reputed faculty members. 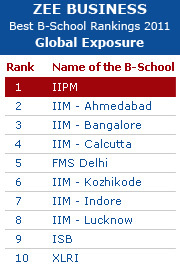 Students from IIPM are at the same time exposed to campus life at these Universities, and interact with regular graduate and undergraduate students in campus at a personal level. Students who have already attended these programmes have been all praise for this initiative, most having said that this was an experience of a life-time.